Jono - I was there too and had the same 'straight through' experience onto the track for parking... but when others turned up at the Wymondham junction 1/2 hour later than me it took them a full hour to get from there to the parking, so traffic did back up badly. Kimbers - one lesson to lean from the 50th if you get the same size of crowd: twice as many loos and tea vans please! I could get rid of that guy no problem, minor photoshop job! About 2 or 3 hours work. Also all the other people outside the tent, car on the right edge, but that would take a little longer, but all you would have left is the little boy in the car and the main racing car. The response on LEC has been slow in taking off, but there are quite a few events arranged around the same time. I've posted the news on the price reduction and am pressing to get three M100's for a stand. I appreciate you are trying to firm up on numbers, but LEC traditionally seems to take its time in getting organised. I'm a bit cheesed off because I can't make it. I missed last year's Factory Day as I had to go train a bunch of Italians, now I have to miss this event as I have to fly to Johannesburg for work on Sunday 23rd for 10 days. Still, as long as I have the same number of orifices when I return as I had when I left, I'll count myself fortunate. 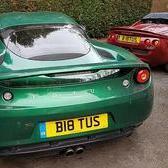 Just been on the Club Lotus website with regard to celebrating 40 years of production on the 23rd September and I quote: 'Anyone arriving in a Lotus can park free of charge on site at Hethel' so why get the bus in from the showground. Are you able to join us at the Hotel for the meal and a beer or twelve on Saturday evening? I've checked the other thread and it reads as if the jury is still out on whether we'll be going to the factory by car or coach. Watch this space I guess. Would not normally miss this, but I will unfortunatly be in China. Have you not heard about my psychic powers, Graham? Nice one mark. Let me know the secret to your persuation. Mines also about 4 years and counting.